Bicycle brakes have changed greatly since the original wagon-wheel brake that pressed a wooden shoe pad against the steel tire, but in some ways have stayed the same. Sliding shoes on the tread of wheels are still being used on most rail freight cars. Most bicycle brakes are operated mechanically, although hydraulic operation is becoming more common, mainly in disc brakes that require a high mechanical advantage between hand lever and caliper that is achieved more easily that way. Rim brakes are still the most common, probably because the rim is a great heat dissipater with a surface that is already there just waiting to be used as a large disc brake. Additionally, a rim brake allows the use of forks that feather out to tiny tips because there are no bending loads at the dropout end. Their drawback is that rims and brake pads wear relatively rapidly in wet weather from fine road grit, even on paved roads. The single-pivot sidepull caliper rim brake came along about 80 years ago and remained the mainstay although it was temporarily displaced by the centerpull, a derivative of a cantilever brake, to take a large part of the sport market in the 1950s, while the cantilever brake with its large tire clearance existed only in a limited way until the advent of the mountain bike where its large clearance for fat tires and mud was important. Recently, other brake designs have emerged to meet those demands. Cantilever brakes offer clearance that fat tires and mud demand. The pads pivoting from cantilever posts on the fork blades, giving large tire clearance and fairly rigid action, there being no significant bending elements in the mechanism. In spite of this they have their drawbacks. Brake reaction forces spread and twist fork blades on which they are mounted. Cantilever pivots are about as far from the braking surface as the brake arms are long, causing the pads to sweep downward at about 45 degrees giving them a large position error that, as they wear, can pass to the inside of the rim, to cause unrecoverable brake failure. The rear straddle cable is actuated by a main cable that requires a cable anchor that is difficult to accommodate with rear suspension, while the front straddle cable presents a hazard in the event of main cable failure, by falling onto a knobby tire to cause wheel lockup. The centerpull brake of the 1950's, was popular for more than a decade, in spite of being entirely without merit, being worse in all respects than the sidepull brake with which it competed. This is a bit of an overstatement. These brakes had unusually good tire clearance, and generally more mechanical advantage than single-pivot sidepulls with equally long reach. It had the same 4:1 hand lever ratio and the same 1:1 caliper, but had large position error, moving its pads upward into the tire as they wore, similar to but opposite to the cantilever brake. Symmetry may have been its main appeal, an aesthetic often admired without functional consideration. Its acceptance might also have arisen from dissatisfaction with some poor sidepull calipers of the time. The centerpull caliper uses a straddle cable on which the main cable pulls from a housing stop attached to the headset or, for the rear brake, to the frame. Its two brake arms pivot from the ends of a connecting bridge that flexes in bending and torsion, giving the brake a spongy response. 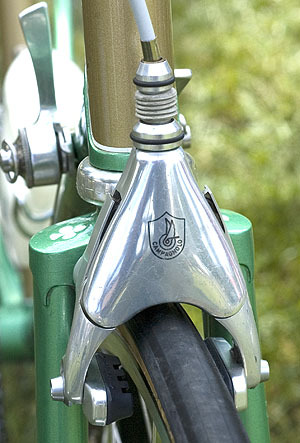 The French Mafac company was one of the main proponents of this design that began to vanish from use with the introduction of the Campagnolo sidepull brake. Servo brakes, ones that use brake reaction force to reinforce braking force, have been designed often and without success, mainly because a small change in friction coefficient causes a large change in braking. The best example of such a change was that of automobile drum brakes that sometimes locked solid, even after releasing the brake pedal, and suffered brake fade. Both problems were caused by slight changes in friction coefficient. That occurred because drum brakes operated with a large servo (multiplier) effect. The servo effect makes the relationship between application force and brake response unpredictable and difficult to control, and for this reason automobiles and motorcycles to switched to disc brakes. With disc brakes, application pressure is at right angles to the rotating disc, preventing any interaction between braking force and application force. For bicycles that effectively already have disc (rim) brakes, introduction of servo effect is illogical. The major problem with servo-type brakes is that they can cause unintentional wheel lockup. Direct-pull or Linear-pull Cantilevers such as Shimano's V-brake ® have generally displaced traditional center-pull cantilever brakes because they offer the same advantages while solving the problem of the brake hanger for suspension bicycles. A direct-pull brake is essentially a cantilever brake that instead of pulling on "bell crank" levers with a straddle cable,uses long vertical extensions of the brake arms that are pulled together like a pair of pliers. This design has the drawback that it is incompatible with other brakes, by having a different mechanical advantage that requires different hand levers. Until recently, most brakes had a hand lever ratio (mechanical advantage) of 4:1, with a caliper ratio of 1:1, making most brakes and levers interchangeable. The 4:1 ratio struck a convenient compromise between the reach of the hand, its strength, and brake pad clearance to the rim. With a higher ratio, more hand motion is required to bring pads into contact with the rim while taking up the clearance that is there to prevent dragging brakes. With a higher ratio, the brake must be adjusted more often to take up pad wear. An important feature of the single-pivot design is that it has practically no position error through its sweep, the pad remaining centered on the rim braking surface throughout its wear life. The main weakness of single-pivot sidepull brakes is poor centering (clearance), caused by sliding contacts of their return springs. Exposed to road dirt, sliding springs change their coefficient of friction unpredictably, causing pads to retract unequally from the rim. This design flaw arises from return springs that pivot from the center of the coils on either side of the brake anchor instead of having a single coil around the anchor bolt that would make them pivot about the center bolt as the caliper arms do. For this, the single pivot brake required liberal clearance to avoid dragging pads, an effect that prevented going to a higher mechanical advantage. The dual-pivot brake achieves both greater leverage and the ability to work with smaller pad-to-rim clearance by its improved centering, by using two pivot points to define a line of action about which its two arms are constrained to move equally, meaning they remain centered. This feature is essential in reducing the pad-to-rim clearance needed for a higher mechanical advantages of about 5.6:1. Greater leverage also required compromise. The offset arm (the short one) sweeps its pad upward into the tire so that its pad position must be adjusted as it wears. Also, the brake cannot track a crooked wheel with, for instance, a broken spoke, and because it has a high ratio, it works poorly, if at all, when the quick release is accidentally left open. And finally, it runs out of hand lever travel 40% faster with pad wear than the former single pivot brake. Low pad clearance and narrow flange spacing of current rear wheels make this brake drag when climbing hills standing. In response, racers often climb with the rear quick release open... and on occasion, fail to close it after reaching the summit. Part of the light feel of the dual-pivot brake arises from the lower (reverse) ratio of the caliper, whose springs do not exert as strong a return force on the cable. With this lower force, a return spring has been added to the hand lever to give the desired return force but with lower cable tension during free motion of the brake (before making contact with the rim). This makes the brake FEEL even more forceful than it is because it has such a light free motion. For lack of power brakes of cars, brakes with variable ratios have been designed for bicycles, one of which was a major setback for Campagnolo. The Delta brake (aka Modolo Kronos), has a mechanism of an equilateral parallelogram in which a cable draws two opposite corners of a "diamond" together, such that the other two corners expand. The motion can be visualized by placing the tips of the thumbs and forefingers together to form a diamond. Moving the tips of the diamond together at a constant rate demonstrates the progressive nature of the mechanism and the resulting braking action, the brake pads being connected by links to the knuckles as it were. The motion is a tangent function that goes from zero to infinity. An example of this is the vertical motion of the top of a ladder, leaning steeply against a wall. As the foot of the ladder is moved away from the wall at a constant rate, the the top of the ladder begins to move vertically imperceptibly, gradually accelerating until, near the bottom, its speed approaches infinity. Although the Delta does not use the extremes of this range, it has this characteristic in contrast to a sidepull brake that has a constant 1:1 ratio throughout its range. Besides its adverse response curve, its pads moved in an upward arc toward the tire like those of a centerpull, which it emulates. Disc brakes on bicycles are not yet as well developed as those on motor vehicles, weight requirements and hydraulics in a small format presenting a new design challenge. Mechanical disc brakes have little to offer in contrast to hydraulics, friction and mechanical clearance giving poorer brake feel. They are probably doomed in competition with hydraulic disc brakes, and judging from the market, their selection is diminishing. The major advantage of mechanical disc brakes is that they use standard brake levers. If you wish to use disc brakes with modern drop-bar brake/shift units, mechanical discs are the only option. Disc brakes have their greatest appeal in off-road riding, especially in wet weather. Grinding grit on dirty wet rims readily gains converts to discs. In contrast, in drier areas, this is less a problem, but with the ability to survive better in the worst conditions than rim brakes, the disc is making advances to the point that more than half the MTB's currently available are disc equipped. Currently, road bicycles seem to be on the increase over off road bicycles, possibly due to Lance Armstrong's success in the Tour de France. It is here that disc brakes will probably not make inroads for several reasons, the main ones being weight and fork design. With rim brakes, forks are loaded in bending at the fork crown that similarly supports road shock, while a disc brake places an equal bending torque at the tip of the fork and only on one blade. A fork can only be slender and light because it carries no bending loads at the dropout. With disc brakes, forks would require a substantial increase in cross section (and weight) and the brake would be heavier. Hydraulic brake actuation comes naturally with the demand for a high mechanical advantage. The need for such a high ratio made cars switch to hydraulics in their early days and is why hydraulics are essential to disc brakes, which require a higher mechanical advantage than other brakes. In addition, hydraulic lines, in contrast to cables, allow small-bend radii and access to narrow spaces. However, as long as rim brakes serve well with the current mechanical advantage, hydraulics will probably remain with disc brakes.